The Tun Tavern takes pride in its legacy. In 1683, when Samuel Carpenter built a simple brewhouse atop an underground spring, he knew he had chosen a location with the finest water in the city of Philadelphia. The quality of his hand-crafted beers was unsurpassed, and Tun Tavern was soon on it's way to becoming one of the most popular meeting places in the city. Politicians such as George Washington, John Adams, Thomas Jefferson and Benjamin Franklin could often be found at Tun Tavern enjoying a hearty brew and a cheesesteak while discussing matters that would have great influence on our nation's future. One of their most profound resolutions was passed on November 10, 1775 just before the revolutionary war with England. In order to protect the port of Philadelphia, the Continental Congress enlisted two battalions of able-bodied seafaring men, naming them "The Continental Marines." The courageous army of defenders evolved into what we know today as The United State Marine Corps. 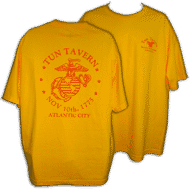 It is with great pride that we have established the present day Tun Tavern in Atlantic City, NJ. The city, known for it's high water quality, has been the perfect setting for the rebirth of one of our country's most famous historical landmarks. As we continue the legendary theme of the original Tun Tavern in Philadelphia, our mission remains focused on our customers, who are the reason for our success. We hope that each and every patron experiences our welcoming staff, our unique hand-crafted beers, and most importantly, our fabulous food, expertly prepared by our Executive Chef and his staff. 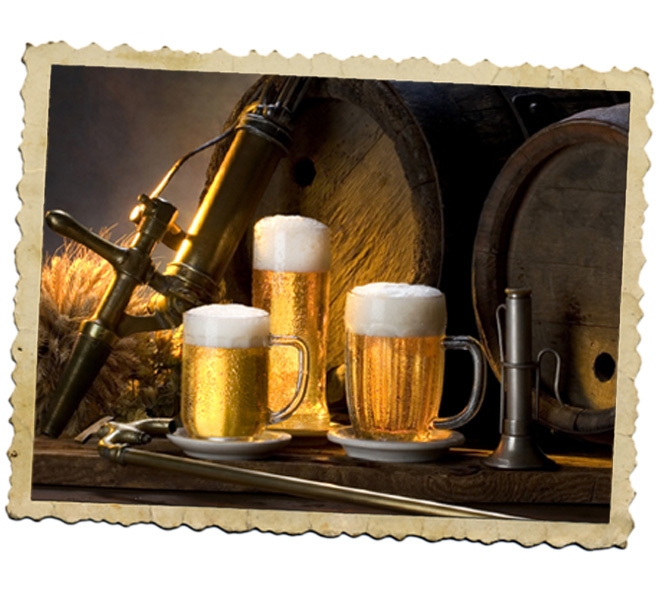 We hope that you will visit Tun Tavern often and enjoy your experience as much as we enjoy serving you! Samuel Carpenter, an English coffee trader, lands in Philadelphia and decides to build a brew house over an underground spring said to have the finest water quality in the city of Philadelphia. Samuel Carpenter's brother Joshua, a brewmaster, assisted in the opening of the brewhouse naming it Tun Tavern. The word "Tun" is defined as a measured cask of liquid or a specific sized barrel. The first meeting of St. John's Lodge takes place in Tun Tavern and America's first Grand Masonic Lodge is born. Benjamin Franklin becomes its third grand master. Franklin also becomes a frequent visitor of Tun Tavern, along with other notable colonials. Tun Tavern's proprietor, Thomas Mullen, expands Tun Tavern due to the high volume of customers. Peggy Mullen, wife of Thomas, discovers that by thinly slicing and grilling beefsteak, then serving it on a bread roll, she could produce a delicious, satisfying meal. She sells these sandwiches by the thousands. Thus, the first Philadelphia cheesesteak is born. Tun Tavern is renamed "Peggy Mullen's Red Hot Beef Steak Club at Tun Tavern". Tun Tavern is frequented by such notables as George Washington, Thomas Jefferson, Alexander Hamilton and Ben Franklin, and sometimes the entire first and second Continental Congress. Tun Tavern becomes known whimsically as "The Governor's Club". At the urging of John Adams, the Continental Congress passed a resolution on November 10 creating two battalions of strong and able-bodied seafaring men to defend the port of Philadelphia during the upcoming revolution with England. 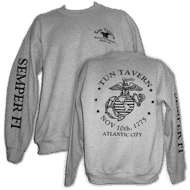 The group is named "The Continental Marines", today known as the United States Marine Corps. Samuel Nicholas is named its first Commandant. 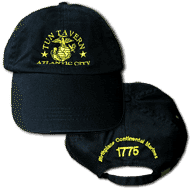 The Continental Marines are formed and recruited at the Tun Tavern. 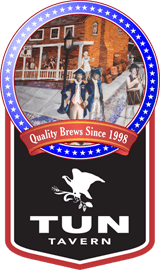 Tun Tavern Brewing Company is established by Montgomery Dahm, named after the tavern and the beloved place of the United States Marine Corps. A central marketing theme for the bottled Tun Tavern lager is created around the history of the Tun Tavern and the people who were part of its legend. 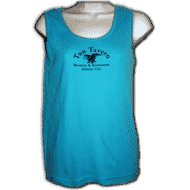 Tun Tavern's beer is handcrafted with all natural ingredients and pure natural spring water keeping the high quality standards of the name Tun Tavern. The first Tun Tavern Brewery and Restaurant is opened in Atlantic City, New Jersey across the street from the new Atlantic City Convention Center. The Tun Tavern will continue the legendary theme of the original Tun Tavern. Founder Montgomery Dahm chose Atlantic City because it is a vibrant city with great potential. Tun Tavern will continue to create the nation's finest handcrafted beers and be the hub of great ideas and actions for the next hundred years.